Nine men. Each of them at a different stage in life, each of them away from home, and each of them striving-in the suburbs of Prague, in an overdeveloped Alpine village, beside a Belgian motorway, in a dingy Cyprus hotel-to understand what it means to be alive, here and now. Tracing a dramatic arc from the spring of youth to the winter of old age, the ostensibly separate narratives of All That Man Is aggregate into a picture of a single shared existence, a picture that interrogates the state of modern manhood while bringing to life, unforgettably, the physical and emotional terrain of an increasingly globalized Europe. And so these nine lives form an ingenious and new kind of novel, in which David Szalay expertly plots a dark predicament for the twenty-first-century man. 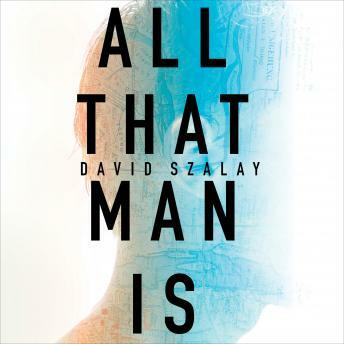 Dark and disturbing, but also often wickedly and uproariously comic, All That Man Is is notable for the acute psychological penetration Szalay brings to bear on his characters, from the working-class ex-grunt to the pompous college student, the middle-aged loser to the Russian oligarch. Szalay is a writer of supreme gifts-a master of a new kind of realism that vibrates with detail, intelligence, relevance, and devastating pathos.